Word search for Aworded. 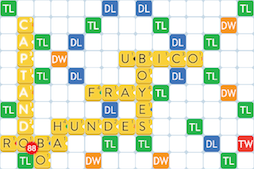 Find the best scoring words for your letter tiles and the words on the game board. Type in the “Letters” field the letters on the tiles that you have in your rack. They are usually 7, but they may be less if you are already playing the last turns of the game. If you have one or more wildcards, type them in literally as * (asterisk). The order does not matter. But only letters and asterisks are valid in this box! Take also into account that not all the letters are valid in every language. Only the letters that are played for the selected language will be accepted in this field. For example, the letter Ñ is not valid in English, neither the letters K or W in Spanish. The letters are those already on the board. Use a . (period) for every free tile space in which you can place a letter tile. When there are many empty tile spaces, you can indicate them with a single - (dash). A dash will be substituted with as many letters as possible from your rack. .C- to find words that can be made in combination with the letter C, with one optional letter to the left and up to seven to the right (see in horizontal). .A.. to find words that can be formed in combination with the letter A, with one optional letter to the left and up to two to the right. -F.N.. to find words that have as many letters as possible to the left, the letter F, one more letter, the letter N, and up to two letters to the right (see in vertical). Whenever you place periods or dashes at either end of the mask, the application will substitute them for as many letters as possible to form words. Therefore, it is not necessary that you have as many letters as periods you use. Simply use the periods to mark the free tile spaces. On the other hand, if you use a mask like, for example, ....A...E...., you must have at least three letters in your rack to fill in the periods in the middle, as the application will search for words that match the letters A and E given in the mask. Under this tab you will find the words that can be formed with your letters—and, if you provided a mask, that also satisfy the search mask. If you provided a mask with your search, this tab appears to show you the words that you can form with just your letters, without considering the search mask. This is simply a convenience so that you can always see these words easily, without having to run a new search. In this list you will find words that can be formed by combining your letters with one additional letter. The extra letter that you would need to look for is marked with a different color. If you see a word here that you would like to play, just see if the additional letter that you would need has already been played and you can use it to form your word. Results can be sorted by the length of the word and by the number of basic points that it gives—without considering the use of special tile spaces. The words that can be formed with just your letters, and those that can be made by combining them with one additional letter, can also be filtered by letter. 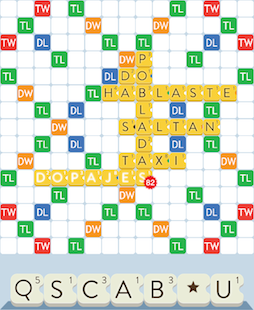 This way you can limit your results to a letter that you want to play from your rack, or to a specific additional letter that you would like to combine yours with. If you want to find words that do not use all the letters you have, use a mask with just dots to indicate the number of letters that must have the words you are searching for. For example, ... to find words with up to three letters. When you are looking for simple combinations such as -O-, i.e. when there is plenty of space at both sides of a letter, it is easier to just run a search for your letters, open the “Combinations” tab, and filter the results there by the letters you can combine your letters with.